Count Dracula’s powers are not to be underestimated. He possesses superhuman physical strength and terrifying psychic abilities, and can change into a mist, bat, or wolf at will. These powers make Dracula incredibly elusive when he does not want to be found, but they also make him a terrifying foe to confront face to face. Nevertheless, if you want to defeat the Count, you must be brave enough to engage in at least one brutal, life-and-death battle against him. 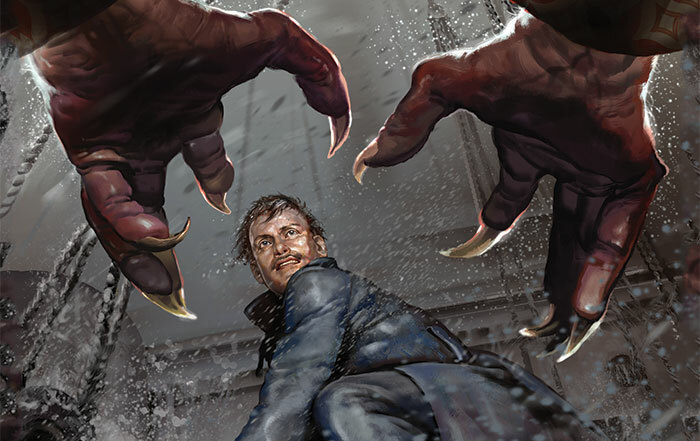 In our third edition of Fury of Dracula, combat has been revised to make your encounters with Dracula more streamlined and decisive than ever before. 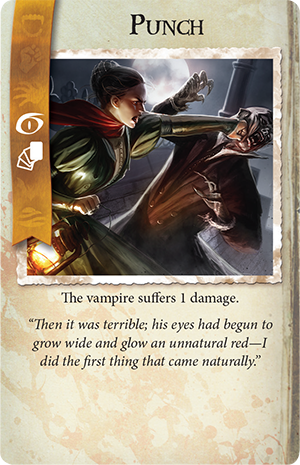 In today’s preview, you’ll learn about the combat system from developer Frank Brooks and discover the rules of engagement with Count Dracula. When I was working on the game I compared first and second editions to see what had changed. 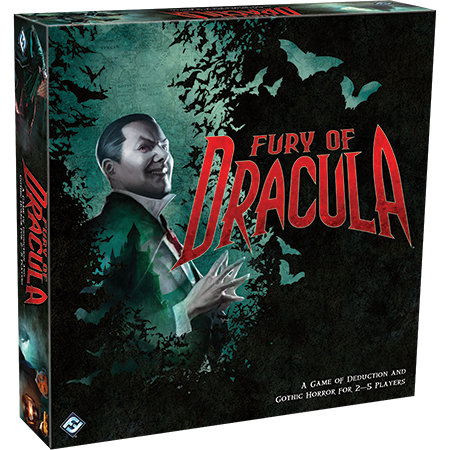 Combat in the first and second editions of Fury of Dracula more or less utilized the same system and it was quite thematic, but unless a player was very familiar with the game, it was quite difficult to know how the cards would interact. Those complex interactions, combined with a roll of dice, meant that it was incredibly difficult to predict the outcome of an attack. Combat could often last round after round without any damage being dealt. But the combat system captured the sense of mystery and uncertainty that the hunters had when dealing with Dracula. I liked that sense of mystery, and tried to maintain it as much as possible. Now, more than at any other time in tabletop history, it is likely that when players take a game to the table, there will be one or more players that have never played the game before. So it has been a goal of ours to make games more accessible and create situations where a brand-new player can compete on some level with an expert player. The expert player will still have more knowledge of the best strategies and all the possible interactions in the game, but the new player will have enough of an understanding to make informed decisions. With this mindset, we created what was essentially a complex version of Rock, Paper, Scissors to give the hunter players more knowledge of what their actions will do. I removed the dice entirely. I feel that, because you don’t know what card your opponent will pick, there are enough random and unknown factors in combat. 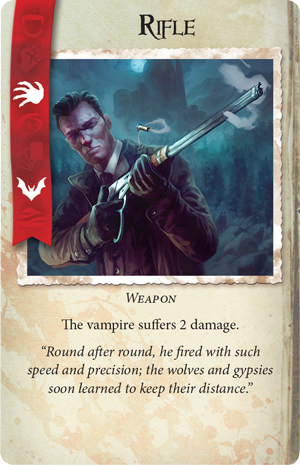 To make things clearer for the hunters, each combat card now bears icons indicating which of Dracula’s cards it counters and what effect happens if Dracula doesn’t stop you. 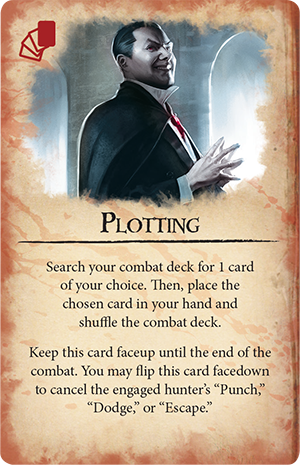 To keep some mystery in Dracula’s workings, the hunters do not at first know which of Dracula’s cards will stop the card they play. But after a few fights, even new players will start to catch on to how Dracula can respond to their actions. 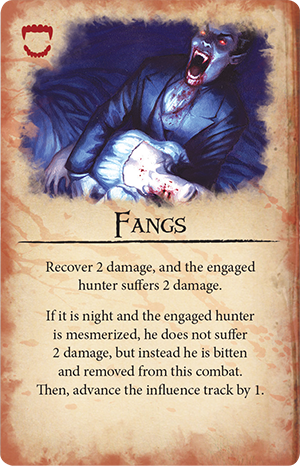 Dracula also now has a random subset of cards at the start each fight, so the Dracula player needs to work with what he has drawn to get the hunter into a bad position. If he could choose his hand freely, he would definitely have the powerful combination of Mesmerize and Fangs in hand. 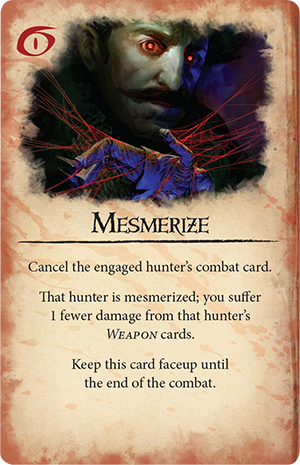 But now a hunter doesn’t know whether to defend against Mesmerize early or gamble that Dracula doesn’t have it at all, so there's more tension for the hunters at the start of any fight. Dracula may also stall by playing Plotting or play Strength early on to break a weapon. With an unfixed set of cards, the opening moves for Dracula are always unclear. Dracula’s cards also do not return to his hand like the hunters’ cards do. This tracks the rounds of combat so that it reliably ends after six rounds. The hunter can now guess which cards Dracula has access to. 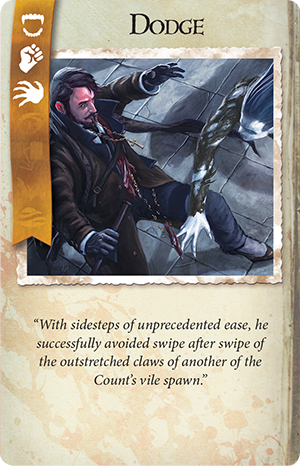 Since there are two copies of each Dracula Combat card (except for the single Escape as Mist ), after he has played one, the hunter knows that there is only one left. The mystery of Dracula lessens over the length of the fight. I feel good about the changes I’ve made to the combat system in Fury of Dracula and hope that you find it as engaging and as fun to play with as I do. 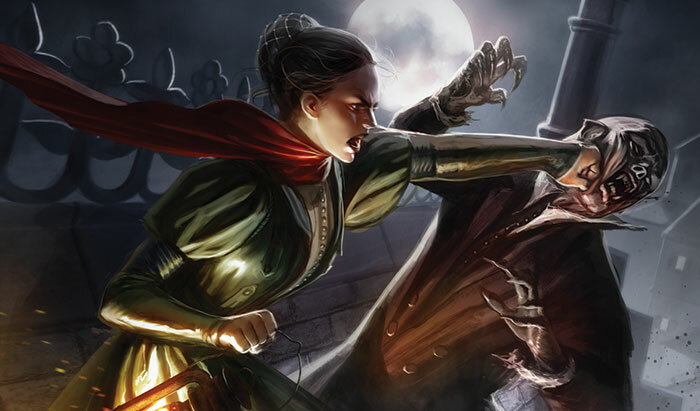 Combat in Fury of Dracula is a kind of dance with death, in which you must make your next move without knowing all of your opponent’s options. 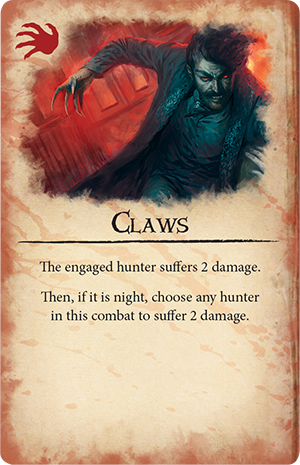 Hunters take into hand all their weapons (items with red banners) along with one each of the Punch, Dodge, and Escape combat cards. Dracula shuffles his combat cards and draws a random hand of five. The involved players each select a card, play it facedown, and simultaneously reveal them. If multiple hunters are confronting the Count, he selects one to engage. 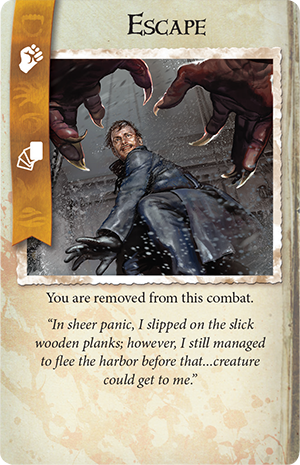 When cards are revealed, you will check if the engaged hunter’s card cancels Dracula’s. 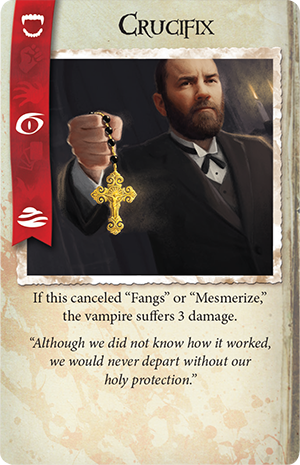 If not, the effects on Dracula’s card are resolved, then the effects on the hunters’ cards. The cards from that round remain facedown in the play area, and Dracula draws back up to five cards. After the next round, the hunters will be able to recover the cards they played the first round. Combat continues until either party escapes, wins the game, or until Dracula has played six cards. Let us say that Dracula attacks Mina Harker and Lord Godalming. He moves into their location during the night, so the fight takes place in the first hours of day, when he is at a disadvantage. Arthur is armed with a Rifle and Garlic , while Mina has only a Crucifix . If Mina is bitten, she will die, so she plays her best weapon: the Crucifix. Lord Godalming takes a shot at the count with his Rifle, and Dracula, knowing Mina’s vulnerability and hoping to eliminate her in one battle, plays Mesmerize and chooses to engage her. The Crucifix breaks Dracula’s spell, so Mina remains safe and deals the Count three damage, while Godalming’s Rifle deals him two more. The round is over; another begins. 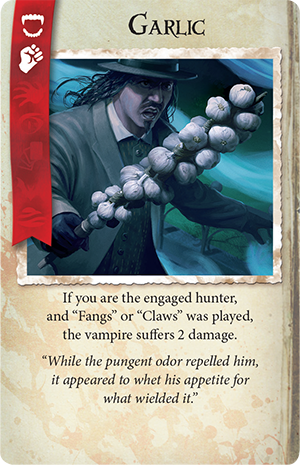 Dracula draws a Claws card into his hand, but chooses to play Fangs instead and recover some damage, engaging once more with Mina. Godalming closes in with the Punch card, and Mina seeks to Dodge any blows that Dracula intends for her. The result is that Dracula takes Godalming’s blow and suffers one point of damage, while Mina remains unscathed. The hunters can now use the Rifle and Crucifix again. 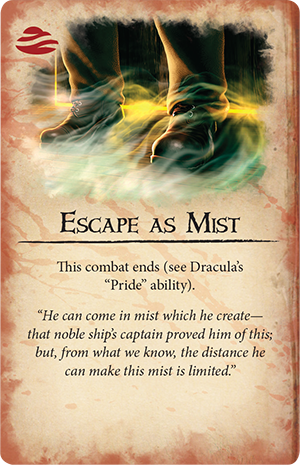 Dracula, already having taken six points of damage, recognizes that he is unlikely to win the battle at this point, and so plays Escape as Mist to end the fight. We’ve received news that a ship filled with mysterious containers is progressing towards us. Its sailors have reported feelings of inexplicable dread, visions of green mists at night, and the unprecedented presence of black vampire bats, even in the middle of the ocean numberless miles from land. Dracula is on his way. Pre-order Fury of Dracula from your local retailer today!